At the age of 15 years 124 days, Mushtaq Mohammad was given the ultimate homework assignment: to find out how to bowl to Garry Sobers. Mushtaq made his debut for Pakistan against West Indies in Lahore on this day, and was the youngest Test player until Hasan Raza in 1996-97, although Raza's official age has since been called into doubt. Not entirely surprisingly for a boy of his age, Mushtaq's was a modest debut: 14, 4, and 0 for 34, while Sobers smacked 72 and Rohan Kanhai 217 in West Indies' innings victory. Birth of Bill Edrich, England's first post-war allrounder. Edrich was a courageous batsman who excelled on bad wickets, and a tearaway quick bowler, dangerous but erratic. He made 219 in the timeless Test in Durban in 1938-39, and in 1947 made 3539 first-class runs - including 12 centuries - while his Middlesex team-mate Denis Compton amassed 3816. The pair were virtually inseparable at the crease. They were together in the middle when England regained the Ashes at The Oval in 1953. Edrich was the cousin of John and played football for Tottenham Hotspur. He had more wives (five) than brothers who played first-class cricket (three). He died in Chesham in 1986. An extraordinary day at Newlands, in which South Africa made 88 runs... and lost 19 wickets. They had resumed in their first innings at 2 for 1, and were routed by England for 47 and 43. The wrecker was Johnny Briggs, who, in the days of four-ball overs, returned match figures of 33.3-16-28-15. Astonishingly, 14 of the 15 were bowled. Fast bowler Megan Schutt became the first Australian woman to take a T20I hat-trick. The dismissals, which straddled two overs, sank India to 26 for 3 in a tri-series match in Mumbai. Smriti Mandhana edged the ball to the stumps off her pad, Mithali Raj off her bat, and Deepti Sharma mistimed a slog and was caught at mid-off. Australia won the match by 36 runs. Birth of the first man to be stumped for 99 in a Test. 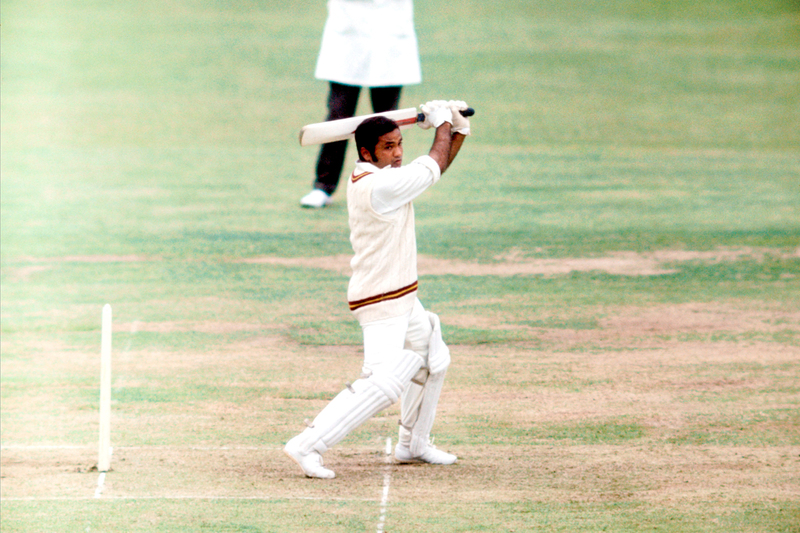 Only two men have ever been dismissed thus, and unlike John Wright, Maqsood Ahmed never went on to make a Test hundred. Against India in Lahore in 1954-55, when Maqsood was stumped off Fergie Gupte one short of his first century, one fan listening on the radio had a heart attack and died. Maqsood, "Merry Max", himself suffered from a bronchial condition for a long time and died in Rawalpindi in 1999. Prosper Utseya, born today, found himself in the Zimbabwe side at the age of 19 when the rebel players withdrew in 2004. Two years later he took over the captaincy from Terry Duffin. An economical offspinner, though not always incisive, Utseya had a successful tour of West Indies that year. He scored his maiden half-century in his 86th ODI - against Kenya in Nairobi - and his second a day later against the same side. In August 2014, Utseya became the second Zimbabwe bowler, after Eddo Brandes, to take a one-day hat-trick - in his 5 for 36 against South Africa in Harare, but Zimbabwe lost the match. In October that year Utseya's bowling action was found to be illegal. Two months later he was cleared to bowl slow and medium-paced deliveries but not his offbreak. After the 2015 World Cup, he claimed in a letter to Zimbabwe Cricket, that he was a victim of racism due to his not being selected in the playing XI. Matt Prior hung on to deny New Zealand a historic series win in Auckland. By tea on day five, with England seven down, chasing 481, it looked like New Zealand would earn their first series victory over a top side in six years. New Zealand had gained a first-innings lead of 239, thanks to two hundreds by Peter Fulton, and a six-for by Trent Boult. Prior, who had top-scored in the first innings with 73, batted nearly five hours on the final day, with resilient company from Ian Bell and Stuart Broad - who at one point in his innings looked set to break the record for the most balls faced without scoring. The three-match series finished 0-0; New Zealand escaped with a draw in the second Test, in Wellington, and had the better of the draw in the first, in Dunedin. Five years later, on this day, New Zealand got the better of England at the same venue. Tim Southee and Trent Boult dismissed England for 58 - their sixth-lowest Test total - in a Test which New Zealand eventually won by an innings. Facing a deficit of 369, built up by Kane Williamson's 18th hundred - a New Zealand record - and Henry Nicholls' unbeaten 145, England fought hard in the second innings and took the game to the last session, weathering a barrage of bouncers from Neil Wagner, but couldn't save the Test this time. Despite a first-class bowling average of only 16, Australia's Edwin Evans, who was born today, played only six Tests, in which he took seven wickets at 47. It wasn't for want of accuracy: Evans could land the ball almost wherever he wanted to, and away from the game he had a reputation of being a kangaroo shooter of a very high professional standard. He died in Walgett in 1921. A walking wicket is born. Indian opener Vikram Rathour came to England with a decent reputation - he had a first-class average of nearly 50 - but he soon became Dominic Cork's bunny, falling for 20, 7, 15 and 4, each time caught in the cordon. His humiliation was completed in the one-dayers, when he became Graham Thorpe's first international wicket.